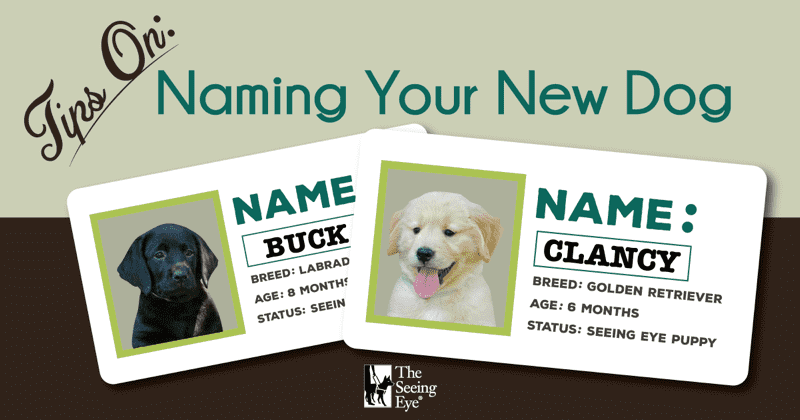 Stumped On What To Name Your New Dog? As the oldest guide dog training school in the world, we name around 500 puppies every year — that's about 42 dogs per month! That’s a lot of name-storming! So we’ve developed a method to make our naming process a little easier and more uniform. KEEP the name to one or two syllables. Occasionally, The Seeing Eye does select three syllable names. Shorter names are easier to say and when paired with a command, make for faster communication with your dog. AVOID names that have negative connotations. Think of what it would feel like to run through a public space shouting your dog’s name. If you would be embarrassed, you shouldn’t choose that name. We name our puppies at 2 weeks of age. The Seeing Eye Puppy Development Manager has the honor of generating and bestowing the names. All the puppies in a litter are given a name that starts with the same letter. The litters are named alphabetically. We begin with A on October 1st, the beginning of our fiscal year. Then each puppy in the next litter gets a name that begins with B, and all the way through to the “Z” litter, when we start over again. including helping us Name a New Puppy! Click here to learn more. SUPPORT THE SEEING EYE TODAY! The Seeing Eye, Inc. is a registered United States nonprofit under IRS section 501(c)(3) with tax ID number 22-1539721. Your contribution may be tax deductible on taxes paid to the United States. Consult your tax adviser.